I tend to disagree with the wording of these surveys because they’re often ambiguous, which could skew the results. In this case, even though I’m a creationist, I don’t believe that humans and other living things have existed in their present form since the beginning of time. I think it’s clear that all organisms change over time- but it’s the type of change that really matters, and it’s this distinction that separates creationists from evolutionists. For instance, depending on how evolution is defined, I could say that I agree that humans and other living things have evolved over time- even though I don’t believe in any form of Darwinian evolution; this is because some people define evolution as “any change” in an organism over time. Therefore, the belief that organisms change over time (which they do) could be considered a belief in evolution. 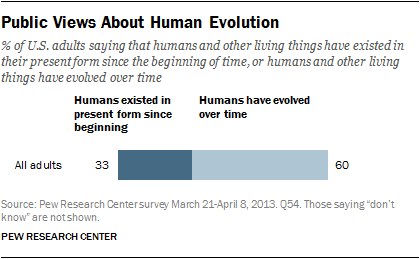 Understanding evolution is much more complex than this survey implies. If I was taking this survey I’d have to consider what the purpose was in order to answer it. If I understood that the survey was attempting to find out how many Americans believed in some form of Darwinian evolution, I’d join the group who believed that humans and other living things have existed in their present form since the beginning of time, even though that’s not what I believe. I can’t help but wonder how many people took this survey without understanding the question in light of what they believe. It could also cause evolutionists to misunderstand what creationists really believe. There’s no question that organisms (including man) have changed since they were created by God in the beginning. All we need to do is consider the various kinds of animals and how they’ve changed over time. All dogs, for example, have descended from the original created kind, which probably resembled the wolf. We can see how remarkably different a Chihuahua is from a Great Dane, a Dachshund from a Boxer, or a Shih Tzu from a Doberman. We can even study the different bear kinds and find that most bears can interbreed. Even though grizzly bears look different from polar bears, they’re still related and can interbreed. The same can be said about any other kind of animal we wish to study. Therefore it’s not surprising that some scientists would claim that these changes are examples of evolution, even though they’re merely examples of natural selection, adaptation and speciation. With all this in mind it’s apparent that someone could call themselves an evolutionist while rejecting the idea that animals and humans all share a common ancestor. My point is that these survey questions could be worded better to avoid any ambiguity. 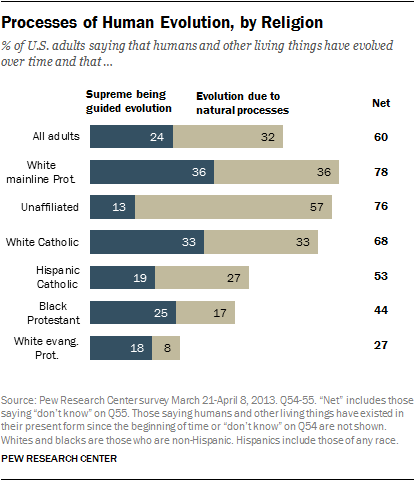 Regardless, the poll did point out that only half of those who believe in evolution also believe it’s the result of natural processes such as natural selection. But while natural selection is a natural process, it doesn’t lead to any real kind of evolutionary change. Natural selection (as opposed to breeding) is mostly responsible for the different species of bears, for example. But keep in mind that bears haven’t evolved any new traits such as feathers or scales. Bears always give birth to bears without exception. Therefore one doesn’t need to believe in evolution to believe in natural selection and speciation. These are different processes that should be recognized as such. While I’m not happy with the questions asked in the survey, the Pew study, in fairness, did consider alternative wording. They asked a random group of respondents about the evolution of “humans and other living things”, and then asked another group about the evolution of “animals and other living things”. The results found little difference. Nonetheless I still would have preferred a better worded question. In fact other polling groups have asked the question differently, and I tend to think that the Gallup polls are worded better. 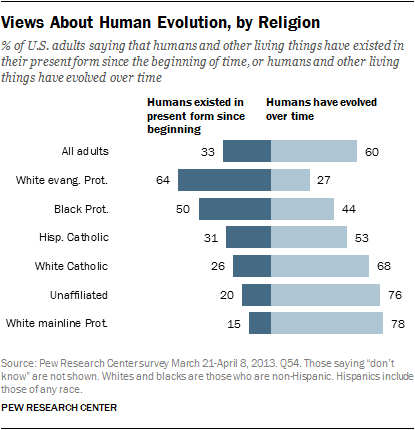 In their 2012 survey, Gallup asked the question: “Which of the following statements comes closest to your views on the origin and development of human beings?” They then proceeded to provide three questions: 1) Human beings have developed over millions of years from less advanced forms of life, but God guided this process, 2) Human beings have developed over millions of years from less advanced forms of life, but God had no part in this process, 3) God created human beings pretty much in their present form at one time within the last 10,000 years or so. Overall I’m glad that most Americans don’t believe in Darwinian evolution, but disappointed that a lot of people do believe in some form of evolution. I think a lot of people are swayed by the portrayal of evolution in the media and by popular figures who tout its belief as imperative for the very survival of our country. No doubt the teaching of evolution in schools and colleges without any criticism or alternative plays a large role in shaping public opinion as well. The truth of the matter is that believing in evolution is meaningless when it comes to our everyday lives. No one needs to believe in evolution in order to build a computer, airplane or car, and no one needs to believe it in order to be a doctor, teacher, business owner, lawyer, carpenter or even a scientist. The only human beings that require a belief in evolution are those involved in the “evolutionary” sciences, which is only a small minority. Everyone else can go about their day-to-day lives without any impact at all. With that said, I’m looking forward to the creation vs. evolution debate between Bill Nye and Ken Ham on February 4, 2014 and hope it has a tremendous impact on this issue. It should make for some good entertainment, so I encourage you to catch the debate live. Despite the unbalanced support evolution receives, I think it’s promising that so many people don’t buy into it. I do agree with you that the nature of these polls and their ambiguous wording is problematic in terms of coming to any sort of meaningful conclusions. However, I’m not sure that I agree that people and the media advocate that it’s imperative to our survival as a species to believe in evolution. I perceive the public argument to be more about the problem of scientific literacy and culture, of which the specific theories people accept or reject are only a symptom. Most scientists find it a constant source of frustration that people more or less choose what they like about science and leave the rest at the wayside. I’d liken it to conversations that you’ve undoubtedly had or have heard of wherein someone arguing against the veracity of the bible cherry picks things out of it (like slavery, stoning people to death who work on the sabbath, etc.) instead of considering the bible contextually and as a whole. For people who have dedicated their lives to science and the pursuit of understanding how the world around us works, it’s kind of bewildering that people accept things that they like about science, but reject the things that they simply don’t like or which challenge them or make them uncomfortable. Everyone loves science when it beams cable to their TV, let’s them cook food without fire, purifies water, or allows them to drive to the supermarket. Or when it cures their infection, removes their cancer, or replaces their faulty heart valve. Or when it puts men on the moon, rovers on mars, or a GPS system in their cars and phones. It seems that a lot of people are willing to unequivocally embrace scientific principles–even ones that they flat out don’t at all comprehend or can’t see–so long as it makes their lives easier. But as soon as science tells them something they don’t want to hear, suddenly it’s all hogwash. Personally, I’ve always found it odd that people would believe the principles of chemistry–even though the evidence is invisible to the naked eye or altogether theoretical–but they won’t believe in evolution, the evidence for which you can see with your naked eye. Why is this? Because chemistry doesn’t make you reevaluate the foundation of your life. There’s nothing philosophically upsetting about what makes up matter–quarks, gluons, muons, bosons, all of those little particles which the average person doesn’t understand and can’t see. So we know what matter is made of, big whoop, right? But where life came from?! Hold up now. What matter is made of isn’t incompatible with religious beliefs, so people accept it without any questions, especially if it benefits them (ahem, plastic, anyone?). But the origins of life itself definitely is upsetting to certain worldviews. What’s disconcerting to scientists is the completely arbitrary manner in which people embrace or reject science. If it makes people feel icky or uncomfortable they simply choose not to believe it rather than reevaluate their own beliefs, and they’ll rationalize thei own personal status quo however they can or want. But that isn’t how science works. You don’t get to just pick and choose what you like and what’s true. It would be like a devout Christian telling you that they believe wholeheartedly in the bible–except for genesis. Everything else in the bible absolutely happened and is 100% true except genesis. Or like someone telling you that 2+2=4 only in China. Science as a process is universal–it doesn’t change depending upon the subject or the experiment, a fact that’s either lost on a lot of people or completely ignored by them. I do like to use exaggeration to make a point, but I think it can be easily demonstrated that the media, popular figures and the “powers that be” are trying to convince the American public that the belief in evolution is imperative to the survival of our way of life. At least that’s the way it’s portrayed. I think the term “fear mongering” applies. Even some of your own comments come across that way, even if it’s unintentional. Forgive me if I come across as harsh, but I take this subject very seriously, and I see a lot of real issues that need to be addressed. I value your opinions and welcome further honest discussion. Richard Dawkins has had some equally snide remarks, calling religion a virus. The point is that these staunch evolutionists are trying hard to convince the public that failure to believe in evolution is really, really bad, and that these “deniers” are stupid, ignorant, disrespectful and mean. These popular figures have voices that reach thousands, and they’re spreading propaganda in order to win as many converts as possible. You do address a concern about scientific literacy and culture, but it’s important to understand that creationists share that concern. Creation scientists also find it a constant source of frustration that people more or less choose what they like about science based on propaganda rather than evidence. I’m quite familiar with your reference to cherry picking and share that sentiment. But we’ve got to move on and address those concerns, and I think creationists are doing a better job instilling scientific literacy, culture, critical thinking, and intellectual honesty. I get the impression that evolutionists are simply trying to prevent this by telling people what they need to think and believe, while stifling any dissent or opposition. If evolution had any merit, then it should be discussed in the classroom and in the public arena; instead evolutionists choose to denigrate and insult their opponents. Your claims are exclusively one-sided in favor of evolutionists- as if they’re the only ones who have a right to be concerned about scientific literacy. But while I share these concerns, these laments come across as insulting. Evolutionists use such tactics rather than science to persuade their targets. However there’s no reason for anyone to buy that hogwash. I reject the notion that the public, by rejecting evolution, is making life more difficult for those poor scientists that believe in evolution and claim the sole right to progress and technology. You castigate those who deny evolution by claiming that they only embrace certain aspects of science that they find convenient, and reject others- why that’s unacceptable! We’ve got to find a way to force them to believe what the majority of scientists believe, right? That way those scientists in the majority will feel valued and won’t have their feelings hurt? Sorry, that’s not how science works. To address your question, the reason why people some won’t believe in evolution is because 1) they believe that God has revealed our origins in the Bible, and we trust an all-knowing God over scientists who change their tune based on politics, philosophy, and are susceptible to peer pressure. 2) There’s overwhelming evidence to support a young earth. 3) There’s overwhelming evidence to reject evolution, which has been falsified time and time again. As for your chemistry question, chemistry works. Evolution doesn’t work. The Christian faith works. I think people see the logic of accepting those things that work while rejecting the things that don’t work. I honestly don’t feel sorry for those scientists who believe in evolution and feel disconcerted by those who don’t believe in evolution. These particular scientists may feel others are acting arbitrarily, but those of us who can think for ourselves have put a lot of thought and effort into understanding science and have rejected their beliefs and find them wanting. Just because these poor scientists feel disconcerted isn’t any reason for religious minded people to simply give up our beliefs and embrace evolution and atheism. We don’t exist to make secular scientists feel good about themselves and improve their self esteem (although some people would like to promote laws compelling this action). You claim that you can’t just pick and choose what how science works. But that’s a straw man argument. Who’s picking and choosing how science works? Evolutionists? Or creationists? Do we get to vote? Is science really based on popularity? Or does science work regardless of consensus? For those who understand what science is, we know that science isn’t up for a vote or based on consensus; it’s not a popularity contest, and it’s not based on self esteem. Science that works is always preferable over science that doesn’t work. I think it’s a sham when evolutionists express these types of whacky sentiments, lamenting why people don’t believe in evolution- as if there’s something wrong with them. Why can’t they see that the problem may lie with their own belief system? That it’s a belief system and not science? Why can’t they reject evolution for the betterment of the country so that we can continue to improve technology and science? I also was not trying to imply that anyone should feel pity, sympathy, or anything else toward scientists. Quite frankly, I’m sure most scientists couldn’t care less what any of us think about them professionally or personally. There was a lot addressed here, but I’ll start with what I think are the two biggest issues that you brought up. I guess the depends on how you define the terms, doesn’t it? A lot of people see adaptation and natural selection as evidence for evolution, and a lot of people see a whole bunch of unanswered prayers and needless suffering and chalk that up under “there is no God column.” Rather than simply rehash old arguments that we’ve had repeatedly in the past, I’ll try this tact: everyone is biased. Everyone subjectively analyzes evidence through their own unique, personal lens. What passes as evidence for some doesn’t pass as evidence for others. I’m not prepared to make any sort of a qualitative or moral statement about that. Perhaps you’re ready to condemn people who choose a level of empiricism over faith, but I’m not. Nor am I ready to castigate those who choose to exhibit more faith than empiricism. And the reason I’m not willing to do that is because I can’t definitely say what is and what isn’t. Is there any amount of “evidence” that science could offer you, personally, that would make you change your beliefs about God or creation? Or not even change them, but just take them out of their box and take a second look at them? What would that have to look like? I know you don’t speak for creationists everywhere or all creation scientists, but do you believe that there’s any level of evidence that science could offer that would cause them to reevaluate there beliefs? Because if the answer to these questions is no, then you’re not at all practicing science as faithfully as you believe, and you might want to rethink that statement about intellectual honesty. Because if there’s no part of a creationist–even the tiniest fraction imaginable–that can step back and reevaluate what they think to be true, then what they’re doing is not science, and there’s really no integrity behind it. Thanks for your clarification. I didn’t realize you were merely presenting the evolutionist’s opposing point-of-view and not your own. I thought it was uncharacteristic of you. Yes, a lot of people do see adaptation and natural selection as evidence for evolution, but I think a proper understanding of these concepts would demonstrate otherwise. I think it’s a misconception that people see a whole lot of unanswered prayers and needless suffering. God answers all prayers, even if they’re not answered the way we’d like. And Christians don’t believe that suffering is needless; we believe suffering, while it’s a horrible experience, has tremendous value, which is why Jesus was willing to become a man and suffer- even to death on a cross. I do agree that everyone is biased. But I don’t condemn any unbeliever for their lack of faith. Faith is between that individual and God alone. I totally understand why someone may not see any contradiction between the existence of God and evolution, and I think you explained it well enough (although creationists don’t believe God created everything exactly as it is now). But as a believing Christian, I see a clear incompatibility that can’t be bridged by mental gymnastics. Yeah, I guess disdain towards secular science would be fairly accurate. I think that’s because I’ve had plenty of interaction with “bad apple” representatives of evolution, and I’ve found that nearly all of them are very antagonistic and hostile towards anyone who rejects their worldview or accepts Christianity. That kind of exposure has made me a bit cynical. I’ll have to admit, though, that you’ve been the lone exception to that, and I’d gladly welcome others with your particular demeanor. And to answer your question about what scientific evidence would make me change my mind about God or creation… well, I very much doubt any such scientific evidence exists. But I’ll try to be intellectually honest since you’ve called me out on that. Finding authentic extraterrestrial life would certainly make me take my beliefs “out of their box” and take a second look at them. Aside from science, if you could demonstrate that Jesus Christ didn’t rise from the dead, then that would make me change my beliefs. So there are two examples- one scientific and the other spiritual. Now your turn… what amount of “evidence” that science could offer you, personally, that would make you change your beliefs about God or evolution? After considering the question, I suppose the most obvious thing would be if God physically manifested himself to us, spoke directly with and to us, etc. But your extraterrestrial example got me thinking. I suppose if, somewhere in the future, as humanity begins to explore more and more of space, there was a distinct absence of life in the cosmos, I would have to reconsider atheism and evolution. Especially if we begin to visit other planets. If one day in the future we visit planet after planet, and there’s still no other life, I’d say that that would warrant a reevaluation. Or if we found something for which there was absolutely no logical, natural explanation for. Idk really know what that would look like or how we’d ever be sure there wasn’t a scientific explanation, but anything that defied that laws if physics or something like that would make me at least wonder about the supernatural. In a similar vein, if I ever physically saw a ghost or someone captured physical evidence of one, I’d probably stop and reconsider things. As I don’t believe in a god, I also don’t believe in immortal souls or an afterlife. So if I actually did see a spirit, apparition, ghost, etc, I would probably have to reevaluate that as well.